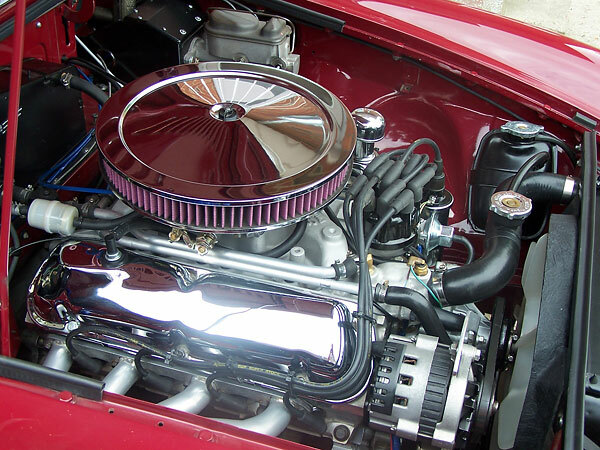 Note: Vehicle was purchased in Texas as a "rust free" example - a complete teardown and ground up restoration followed and the first Oldsmobile 215 conversion was completed in 2 years. Graham explained: I enjoyed the Olds-powered conversion for 2 years and at the time it made most sense since the BOP/Rover parts/conversion support was in place. After enjoying a spirited ride in Steve Carrick's "Barney" a few years ago, it was inevitable that a move to the Ford 302 was in the cards. 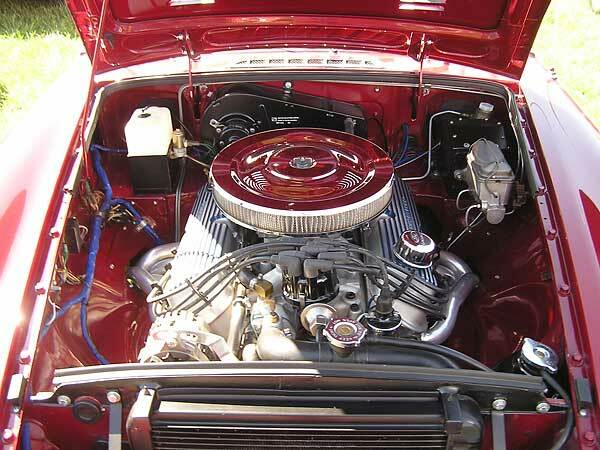 Tip: Choose the right engine first time around and save time and money! 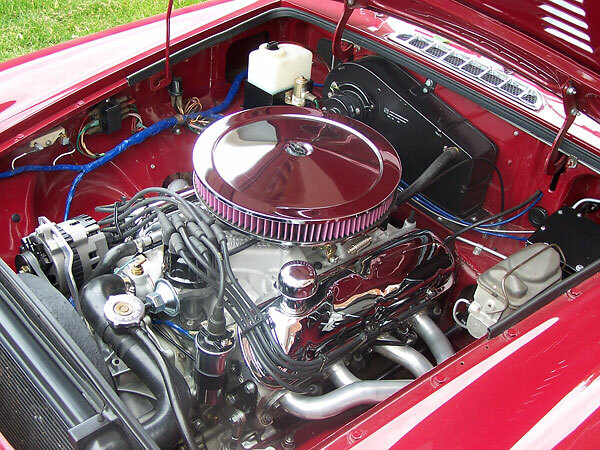 Engine: Ford 302 H.O. roller lifter engine from a 1989 Mustang rebuilt with +0.030" Keith Black pistons (9.1:1 compression ratio), Ford Racing GT-40 aluminum heads, Fidenza aluminum flywheel, Ford Racing B351 roller rockers. Remote oil adapter and filter mounted in left wheel well. Engine mount isolators are from a 1962 Comet (289). With the BOP/Rover conversion, an engine steady bar was added to the front of the left cylinder head and, in my opinion is needed, since the MG engine isolators allow a lot of engine rocking. It has been retained with the Ford, but I don't believe it's as critical, as the Ford mounts are much more rigid. Intake: Edelbrock 2121 "Performer" intake, with 600cfm Edelbrock carb. 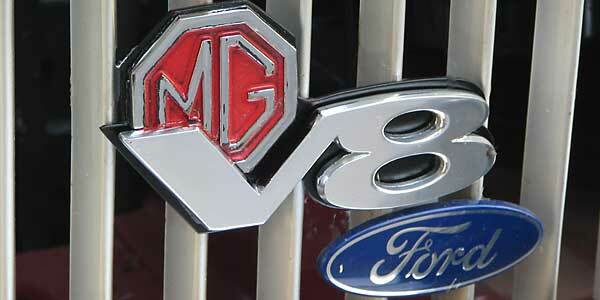 This combination is low enough to fit under the standard MG hood. In fact, a 1/4" phenolic spacer was added under the carb to help reduce fuel percolation. Air cleaner is a 14" x 2" round with a 3/4" drop base. Cam: Ford Racing "B303". Valve lift is 0.480" and duration is 224 @ 0.050" for intake & exhaust. Rocker ratio is stock (1.6:1). Eng. 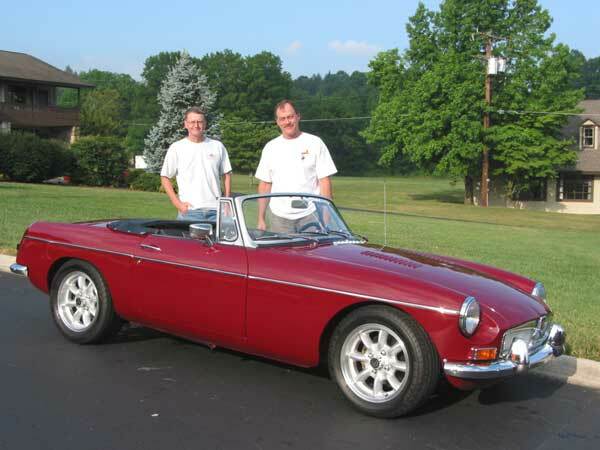 Electrical: Base wiring is standard MG, but with wiring reconfigured for 8 cylinder conversion and distributor location. 1.5 ohm ballast resistor added in lieu of ballast wire internal to the original harness. Standard early "points type" Ford distributor converted to electronic with Crane XR-1 electronic module. Distributor drive gear changed to steel to be compatible with the steel roller camshaft. Original SU fuel pump was replaced with a Carter P-4070 with a Facet pump mounted in series and with an electrical selector switch in case of failure of one of the pumps. Cooling: Ford "short" water pump M-8501-E351S. Early Ford 4 bolt crankshaft pulley and water pump pulley for V-belt drive. 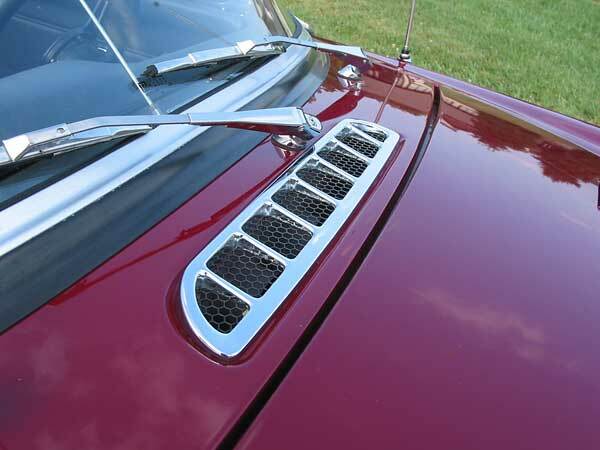 Crossflow radiator is made from early 1980's GM truck end tanks, with a louvered serpentine brass core. Core area is 296 sq.in. Overflow reservoir from late "B" added. 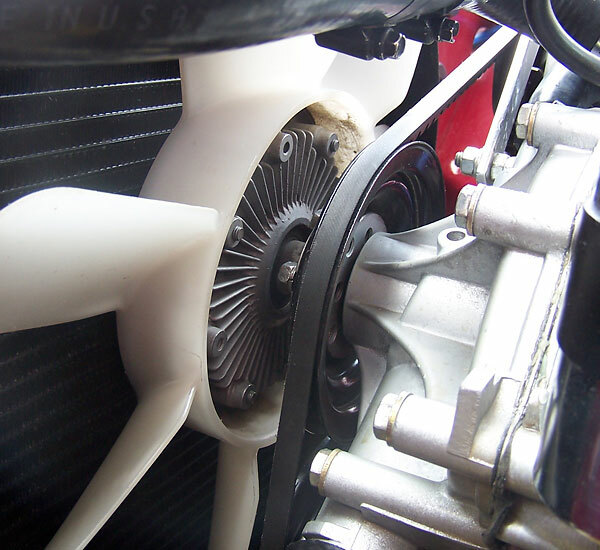 Fan drive is a water pump mounted viscous unit from an early '80's Mitsubishi B50/Rampage with 15" plastic fan. Car has been in some hot day traffic and the cooling system typically stabilizes half way between "N" and "H". Exhaust: Headers by Coyote Engineering, with 1.5" primaries and 2.5" collector. They were ceramic coated before installation. 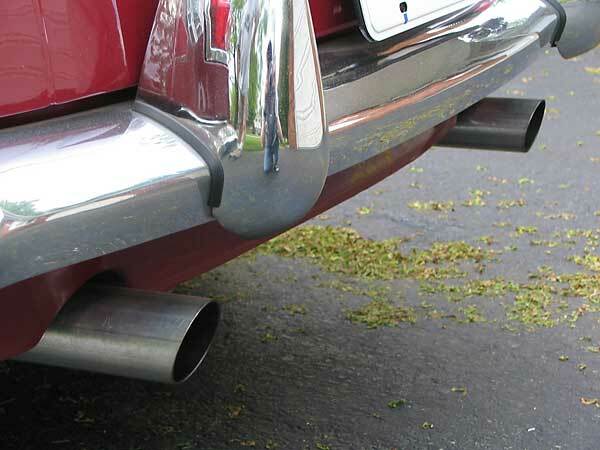 Exhaust system is 2.25" diameter aluminized steel with dual Dynamax mufflers and with an "X" crossover pipe. The fuel tank was centered in the chassis to allow dual exhaust. Transmission: Borg Warner "World Class" T-5 (from a Ford Mustang) with the following gear ratios: 3.35, 1.93, 1.29, 1.00, and 0.68:1. Shifter has been reworked from a standard Chevy S10 version, chrome plated and then assembled into a Ford T5 shifter housing. Clutch: Standard 1989 Mustang clutch & pressure plate. Original "pull" type cable actuation has been converted to a "push" slave cylinder from a 1980's Nissan. Clutch master cylinder is original. Driveshaft: 2-1/2" diameter custom-length purchased from D&D Fabrications. 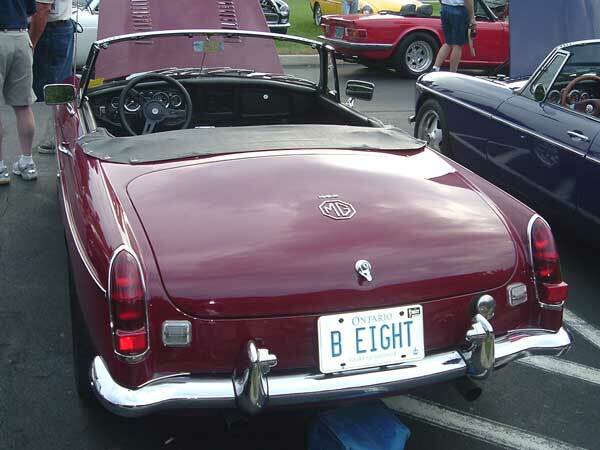 Rear Axle: Ford 8.8, 3.27:1 Traction-Lok rear axle, shortened to same width as MGB disc wheel axle by Moser Engineering. 4 stud x 4-1/2" MGB lug pattern was retained. All suspension brackets cut from original axle and rewelded to new, plus sway bar brackets. Front Suspension: Lowering front coil springs added to otherwise stock MGB front suspension, fitted with red polyurethane bushings. Crossmember has been notched 1.5" to accommodate the lower Ford oil pan. Front swaybar has been uprated to 3/4" diameter. Note: to facilitate full wheel-cut Graham used a press to narrow the swaybar, reforming its center section with a gentle curve as shown above. 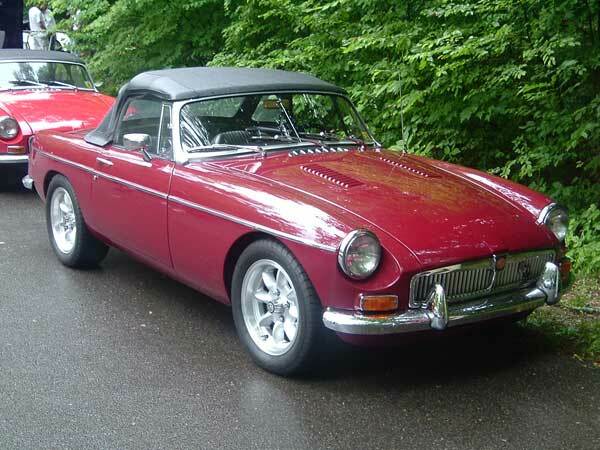 Rear Suspension: Standard lowering MGB leaf springs and w/1" lowering blocks. Monroe 5877ST tube shock conversion. Late model 11/16" dia sway bar added and required sway bar attachment bracket fabrications welded to the body underside. 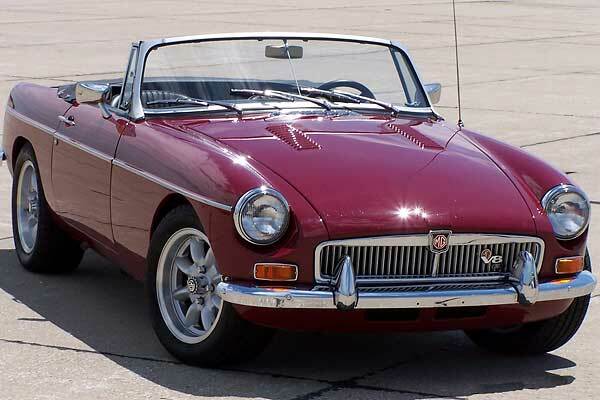 Brakes: Standard MGB master cylinder/booster was replaced with an aluminum 1" bore non-servo master cylinder from an early 1980's Lincoln and plumbed with a Ford proportioning valve. Pedal ratio was increased from about 4:1 to 6:1 by raising the pushrod attachment at the foot pedal. (Front) Standard MGB brakes with "Green stuff" pads. (Rear) Ford disc - standard 10.4" dia with 1995 Mustang 8.8 axle. Emergency brake cams reworked to allow MGB e-brake cable actuation. Wheels: Panasport 15x7 with 22mm offset. Tires are 225/50ZR-15 Dunlop SP Sport 8000. Body/Interior: 1976 rubber bumper car converted to chrome bumper. Original console removed in favour of the carpeted look of a '68 and added an early 1970's console to house the radio/CD and clock. Side marker lights removed and early '62-'69 rear taillights added. 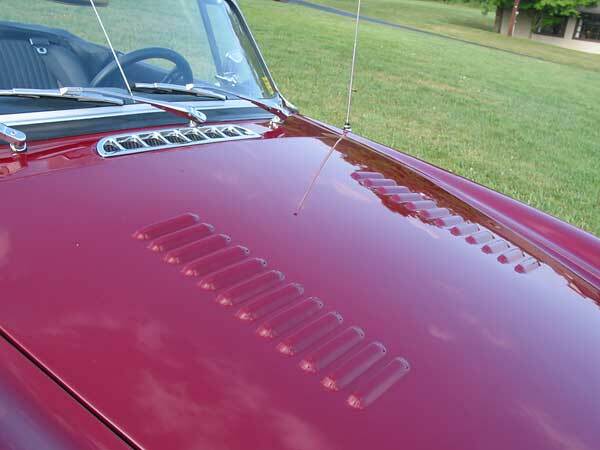 Original steel hood was replaced with early aluminum for 17lb weight saving and two rows of louvers added to help cooling. Electrical: Tachometer converted for 8 cylinder pulses. Speedo is 140mph unit from a '69 MGC and calibration is done by matching the plastic drive and driven gears within the T-5 transmission. 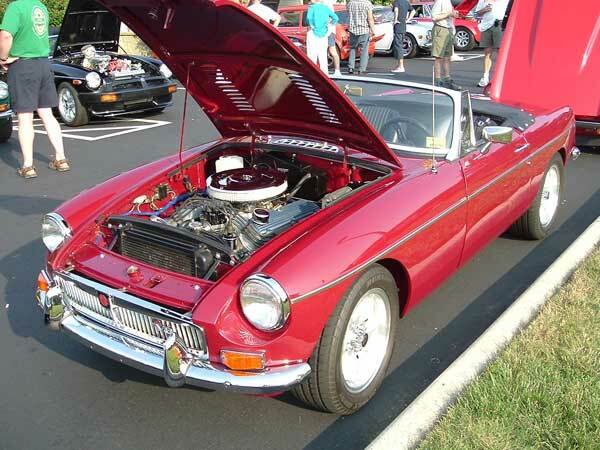 Performance: Dyno'ed at the British V8 meet in 2005 (at Terre Haute IN) at 247hp at rear wheels. This was a hot day, so the engine mounted viscous fan was running. Sources: One cannot stress the importance of doing a lot of research/homework prior to starting a conversion. It was at the 2000 Cleveland show that I gathered most information, took photographs, asked questions, gathered supplier leads, took a test drive and formulated a plan. Supplement with Roger Williams excellent "How to...." books and the would-be converter is well armed for the job. Dan LaGrou of D&D Fabrications fortunately has his business about 2 hours from my home and was an excellent resource for conversion parts, information & experience on the BOP/Rover engine. Comments: One of the more serious problems encountered with the first conversion was one that has plagued a few of us: a leaky clutch hydraulic throw out bearing (HTOB). This is a very frustrating issue to have for a brand new (and expensive) part since the transmission has to removed to repair (in my case a cut "O" ring directly from the factory.) With the Ford conversion, an externally mounted clutch slave has been adapted and if a leak develops, it can be changed out in minutes. 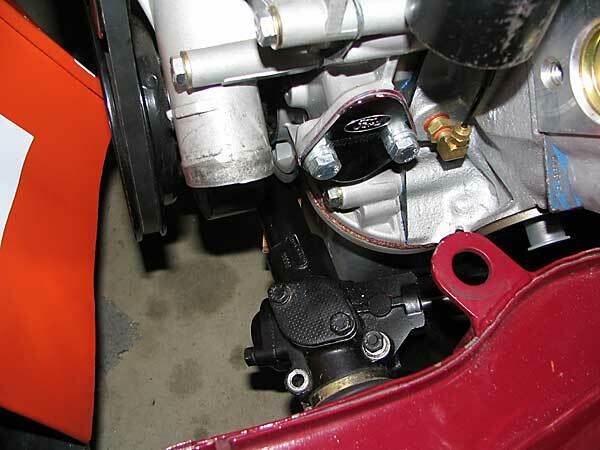 A minor ongoing issue with the Ford conversion is to monitor how much the engine mounts settle. There isn't a lot of clearance between some engine to chassis components (specifically between front harmonic balancer and steering rack) and I have had to add a couple of 1/16" shim plates to the front engine mounts to regain clearance. 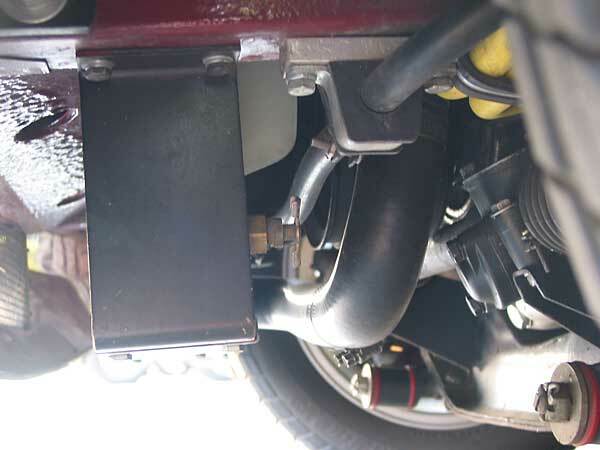 In some cases, converters have developed their own engine mounting locations, accessory drives, unique component layouts, etc. 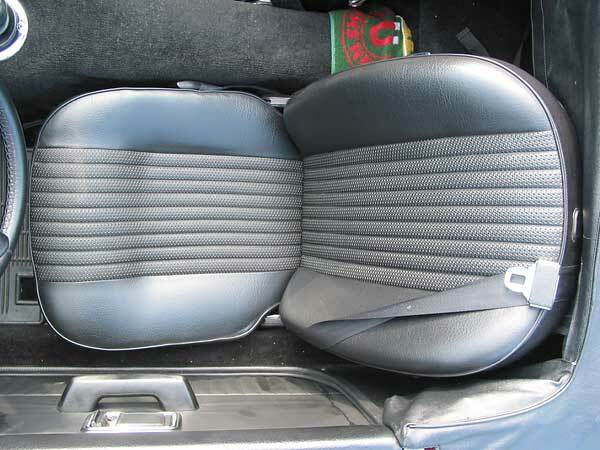 and it is essential that, when obtaining parts, to ensure that they will work in your specific case. For example, if purchasing a set of headers that were designed for a specific engine position, don't be surprised if they don't work for yours and will not allow full wheel lock or the collector runs into some brake components - do your homework! It is very unlikely that a first conversion attempt will be perfect. You'll find, generally, that there will be ongoing improvements to the first design... that is what makes the process enjoyable! Now if I can only justify Ted Lathrop's front suspension to the missus! 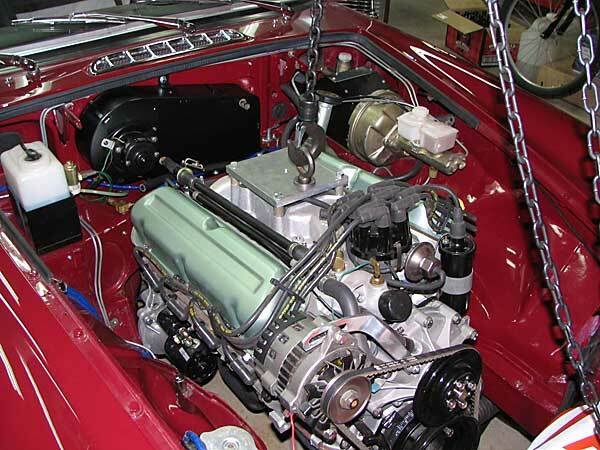 Completed: Original conversion was completed in late 2002 with a 215 cu.in Oldsmobile engine and T5 transmission. Powertrain was converted over to Ford components in the Winter of 2005. Miles driven: About 10,000 so far - most of them "enthusiastically"!